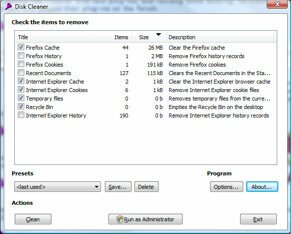 Previously we mentioned about FCleaner that can help you to clean and optimize Window systems, but if you need something really simple just to remove unused and garbage files, here is a good alternative option that you can consider. Named as Disk Cleaner, it is a lightweight tiny freeware that can be used to scan and clean up temporary files, log files, web browsers’ cache, history, cookies and many more. Once install and launch the utility, you will be brought to a simple GUI. Without complicated setup and learning curve, it will automatically scan through your whole system for files that can be deleted with the potential space saving figures once the action is executed. Designed in pretty simple and neat interface, it will list down the Title, Items, Description as well as Size that can be saved under the specific category (or title). Users can easily sort and clean those files that occupied hard disk space the most and simply tick on any desired category followed by a ‘Clean’ button press will execute the cleaning process immediately. If you have not run any cleaning utility for long time, now is the right time for you to run this and you will be surprised on how much junk files that it could detect and space that you could save. Disk Cleaner is totally free and you can get a free download at here for Windows Vista/7 OS or here for Windows 9X/XP OS for immediate use.